IPdigIT Prezi: a successful freemium model? Prezi: a successful freemium model? Last year, I had to deliver a speech about the economics of Internet to a non-technical audience. To make my presentation (hopefully) more pleasant for this audience, and to seize the opportunity to learn a new application, I decided to use Prezi. The application was rather new at the time (it had been launched in 2009 but the buzz really started in 2012) and I was happy to show off by using it. Yet, that was not my unique motivation: I also wanted to use Prezi as an illustration for one of the questions that I was addressing in my presentation, namely: “How is it possible to make money with free stuff on the Internet?” (a theme that I have already developed on this blog, in French, here and here). There are three main economic environments in which freebies can be successfully used to make a profit: environments with network effects, with switching costs and/or with uncertainty about the quality of products. It appears that Prezi stands at the crossroads of these three environments. 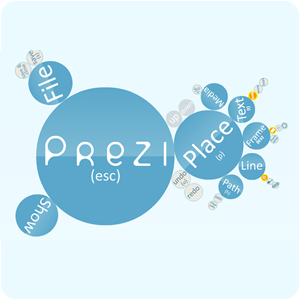 Prezi has implemented various ways to build a true community of users around its application. For instance, users are invited to register via their Facebook profile, to make their presentations public and even, if they wish so, to allow other users to modify these presentations. Prezi also offers an application for conducting meetings, as well as a forum where users can share tips or post questions and answers. Finally, Prezi hires “student ambassadors”, whose mission is to create word-of-mouth on campuses around the world. Clearly, all these measures are designed to generate network effects: the more Prezi is adopted, the more it becomes interesting for new users to adopt it too. Like most applications that require some investment of time to learn how to use them properly, Prezi creates switching costs. Though using Prezi is quite intuitive, the application has some specific features, whose knowledge can hardly be helpful for the use of other applications. In addition, the existence of a community of users and of sharing features contributes to somehow lock users in. Leaving Prezi for an alternative application would be synonymous with forgoing the benefits related to learning the application and to interacting with other users. Like any application, Prezi is an “experience good“. By this we mean that users can estimate how much the product is valuable for them only after having taken the trouble to learn how to use it. … allows wary users to get acquainted with the application and realize how much they value it. Of course, Prezi will never become a profitable business if the majority of users content themselves with the free version. The objective is to bring a sufficient number of users (mostly businesses) to turn to the paid versions, which provide users with a variety of advanced (premium) features. This is the so-called “freemium” model, which is based on a menu of free and premium versions. Note that I wrote this analysis one year ago. Since then, I haven’t checked whether the freemium model does indeed work for Prezi. This is what I would like you to check for me. You may also want to have a look at other attempts to use the freemium pricing strategy (a useful entry point could be this presentation), or to discuss whether Chris Anderson was right in 2008 when stating that “$0.00 Is the Future of Business”.